Products / Summer Honey Body Oil Spray 6 oz. 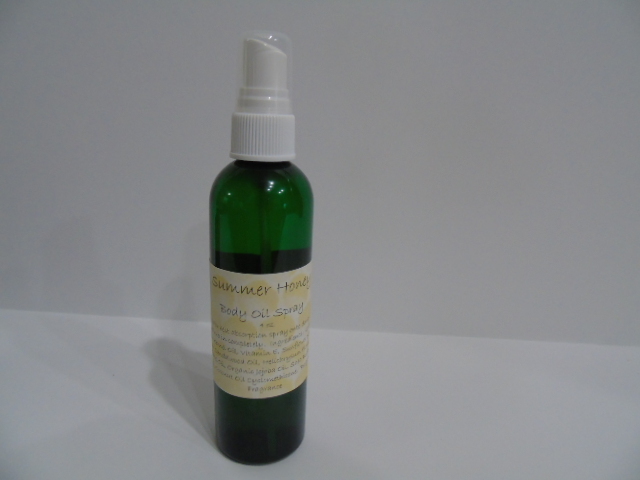 Summer Honey Body Oil Spray 6 oz. This delightful oil spray brings balance and brilliance to hair, skin, hands, feet and everything in between. This light oil is anti-oxidant rich with grape seed oil, amazing “liquid gold” argan oil and more.Sscented with natural honey fragrance that is simply intoxicating. Ingredients: Grapeseed Oil, Argan Kernel Oil, Vitamin E, Sunflower Seed Oil, Cyclomethicone, Australian Sandalwood Oil, Organic Helichrysum Flower Oil, Pink Grapefruit Peel Oil, Bergamot Peel Oil , Fragrance.